Tonight was one of those epic crazy nights, which is exactly why I decided to do these picture posts this week: because there’s been scheduling and cooking hell in our house, and only by staying organized and focused have I been able to make family dinners continue undisturbed. This week, as far as I’m concerned, is the perfect test case for what the average busy family goes through with some regularity, and if I can make dinner happen right now, I can just about make dinner happen any time. We usually get home from picking the boys up at preschool around 5:30 or 5:45. Tonight we pushed and got in the door at 5:32 exactly. I knew I had to be right back out in the car by 6:25, with everyone having been fed and kissed and cuddled, in order to be at the concert hall in time for dress rehearsal with the Philharmonic. Yikes. Oh, and it just happens to be Cinco de Mayo, so dinner really ought to be somewhat festive. No pressure. Luckily, my family really likes fish and seafood; and luckily, fish cooks quite quickly. Also, it’s not hard to come up with a fast, albeit probably quite inauthentic, Mexican-ish spin on dinner if you have flour tortillas in your refrigerator at all times, which we do. 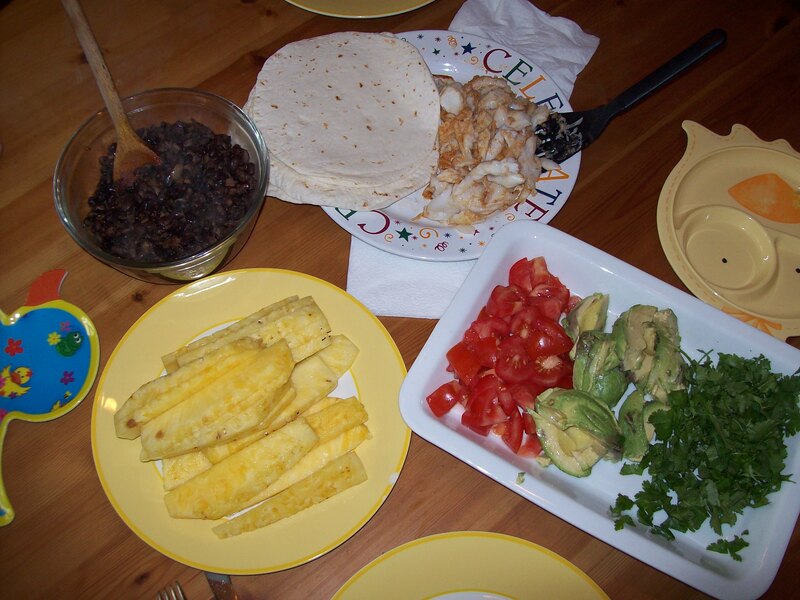 So I turned to an old favorite of J.’s, which I usually reserve for warm weather: Grilled Fish Tacos. Kid success rating: 3 out of 5 (yeah, I know — it’s been that kind of week!). P. was just not in an eating mood no matter what I was putting on his plate tonight, unless it happened to be peanut butter. (It wasn’t, obviously.) He did like the pineapple, though he didn’t want me to know that, and he picked a bunch of the bacon out of the beans before grudgingly eating a few beans and some tortilla, all with elaborate pains to prove to me that it was a great trial. L. did better, but L. almost always does better. He wasn’t a fan of the beans, though I didn’t expect he would be; he did eat fish and tortilla and some avocado. Cost rating: 4 out of 5 tomatoes. It’s really an inexpensive meal, all things considered; but I know that avocados, at least here on the East Coast, are not really a budget item. Also, fish can be slightly pricey, though in Rhode Island we’re blessed with plenty of affordable seafood items. I sprang for the fresh local cod, though, at $9/pound. Still, with only one pound of fish needed for the meal, and everything else being relatively cheap, this was by no means a strain on our budget. Time to table number: 20 minutes. Yup, grilled fish is FAST. And I did use canned beans, though I bought the salt-free variety, so all that needed to be done was to render out the bacon with some chopped onion, add the beans and seasonings, and warm the whole thing through while the fish cooked. A little slicing and dicing for the veggies and pineapple was all that remained. I’d barely call this cooking; I think I could have put this dinner together quite competently when I was still in high school. This brings the tally for 4 meals to just around 90 minutes of cooking time all week. That means I’m averaging under 30 minutes for fresh, unprocessed meals, and nobody’s gone to bed hungry. Tomorrow night will be a “fend” night, so I’m off duty entirely. It seems to me that for a hectic week, things have gone pretty smoothly. I stayed on track, stayed organized, and a little advance planning paid off. I think I’ve earned a couple of evenings out of the kitchen. If I can make myself stay away, that is.